How much plastic does it take to kill a turtle? The risk that plastic pollution poses to the world’s declining sea turtle populations has been quantified for the first time. Analysis of nearly 1000 turtles found dead and washed up on beaches around Australia showed that the more plastic a turtle consumes the greater the likelihood that it was killed by that plastic. Previously, it was unclear as to whether the plastic in our oceans is actually killing sea turtles, or whether they are simply ingesting it without significant harm. "We knew that turtles were consuming a lot of plastic, but we didn't know for certain whether that plastic actually caused the turtles' deaths, or whether the turtles just happened to have plastic in them when they died," Principal Research Scientist with CSIRO Oceans and Atmosphere, Dr Chris Wilcox said. "In other words, we wanted to know 'How much plastic is too much plastic?' for sea turtles." The scientists found that once a turtle had 14 plastic items in its gut, there was a 50 per cent likelihood that it would cause death. However, that's not to say that a turtle won't die if they consume less than 14 pieces of plastic. "Even a single piece of plastic can kill a turtle," Lecturer in Animal Ecology at the University of the Sunshine Coast Dr Kathy Townsend said. "Some of the turtles we studied had eaten only one piece of plastic, which was enough to kill it. In one case, the gut was punctured, and in the other, the soft plastic clogged the gut." The research showed that a turtle had a 22 per cent chance of dying if it eats just one piece of plastic. Sea turtles were among the first animals recorded to be ingesting plastic debris, a phenomenon that occurs in every region of the world and in all seven marine turtle species. Globally, it is estimated that approximately 52 per cent of all sea turtles have eaten plastic. Determining the effect this is having on turtle mortality is a huge step forwards for understanding the impact of plastic pollution on global sea turtle populations. "Millions of tonnes of plastic debris is entering our world's oceans on a yearly basis," Dr Wilcox said. "The model we've developed can be adapted to help us understand the impact of plastic ingestion not just on individuals, but whole populations of other endangered marine species as well. "The better we understand the issue, the better equipped we are to address the problem, and work towards viable, scalable solutions." One of the first meals eaten by this sea turtle post-hatchling turned out to be deadly. It died from consuming over 20 tiny pieces of plastic, many of which were about the same size as a grain of rice. This tiny green sea turtle ended up consuming over 40 difference pieces of plastic, ranging from plastic bags, bits of hard plastic, duct tape and balloons. Dr Kathy Townsend attending to a sea turtle that was brought into care for having ingested marine debris. This emaciated juvenile green sea turtle was brought in for care, showing signs of having ingested plastic and other debris. Sea turtles have downward facing spines in their throat which prevents them from regurgitating, making them susceptible to gut impaction from ingested marine debris. Over 100 plastic items recovered from one green sea turtle. Items included plastic bags, hard plastic fragments, balloons, lolly wrappers, and pieces of rope. When the load gets this high, the probability of death reaches 100 per cent. 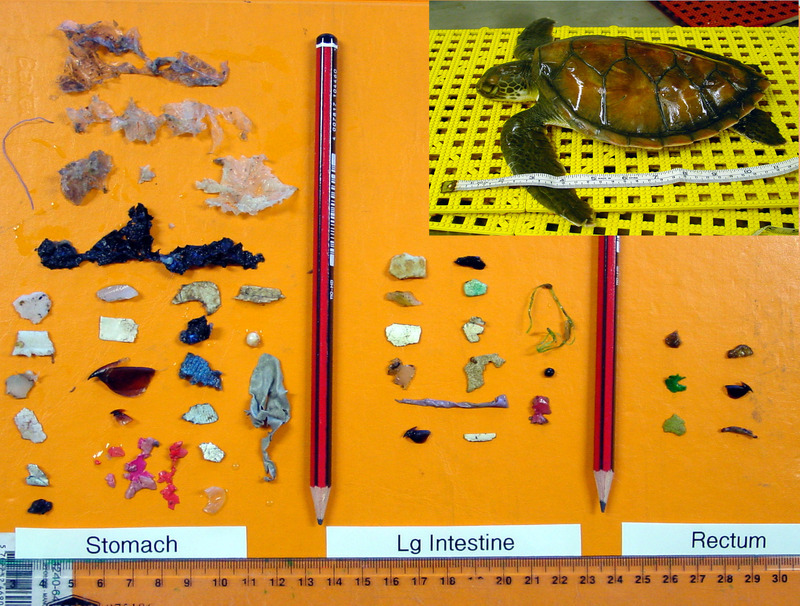 This juvenile green sea turtle died by eating just 13 pieces of single use shopping bags, balloons and lolly wrappers. Dr Kathy Townsend and an Earthwatch volunteer undergo a necropsy on a juvenile hawksbill sea turtle. One of the close to 1000 sea turtles that were necropsied for this study. A mixture of plastic and pumice stone is pushed onto the back beach of North Stradbroke Island after strong north easterly winds. Some of just some of the 150 billion metric tonnes of plastic estimated to be in the world’s oceans. Two healthy green sea turtles playing in the shallow waters of Lady Elliot Island. Sea turtles swiming through the waters of Lady Elliot Island.